I use closely-related variations of this for e-mails, physical objects, ideas, recollections that I need to do something, and anything else in my life I might need to deal with. By putting something through this process, I can take it off my mind because I know I’ve captured it and know what to do next. If you know everything that I might do with a piece of paper, I can make it stop nagging me. If it’s not something I ever expect to need, use, reference, provide to someone else as documentation, etc. I recycle it (or if it’s non-recyclable for some reason, throw it away). If it’s something that I want to have for reference but I don’t already have a file folder for it, I make a new folder for it and file it, even if it’s a whole folder for one tiny piece of paper. I file it in an existing folder if I want to keep it for reference and already have a file folder for it. If it’s something I’d like to read but there’s no task that needs to be accomplished and no deadline for reading it, I put it in my to read pile. Things that need to be read in a specific period of time I treat as tasks: see #6. If it represents something to do that can be done within 2 minutes or less (your cutoff can be a bit shorter or longer if you want), I do the quick action it requires, then file or recycle it. I do this even if the action is low priority, because it will take me less time to follow up right away than it will to decide, make a task, maybe file the paper, and come back to it later. If it represents something to do that can’t be done quickly, I make an entry in my task system, then take the paper and recycle it, file it, or put it in my “action-related materials” tray. Making an entry in my task system includes even things that I just might want to do someday. The items I’m not sure of just go on what Allen calls a “someday/maybe” list. If it goes in a special location (like a schedule I want to put up on the fridge), including a special “reference” location (like the tray I have for my son’s drawings), I put it away where it goes (or put it in a pile to be brought to such locations as soon as I get up). If it’s part of a body of material I need to keep for a while but seriously doubt I’ll need to reference (like paperwork from an old business that should be kept for a few years just in case a former client needs to know something), I put it in a box of archived papers and store the box. What about data entry? For our purposes, data entry is just another kind of action. For instance, if you have one business card of someone you may need to get in touch with, entering that card into your PDA or Rolodex or whatever you use is probably a less-than-2-minute action. If you have a bunch of such business cards, you can rubber band them together, put them into “action-related,” and add a task to your list saying “enter business cards into PDA.” If the card is supposed to remind you to do something, it’s probably not doing a very good job with that by just lying around: enter the task into your task system, and include the contact information right along with the task. Before I could start this process, I got myself a bunch of blank file folders and a label maker (optional), and I set up a good task system that I review regularly (very important! set this up first if you want to use this process) so that no important information will be forgotten or lost. One great thing about this approach is that I don’t have to take care of papers in any particular order. 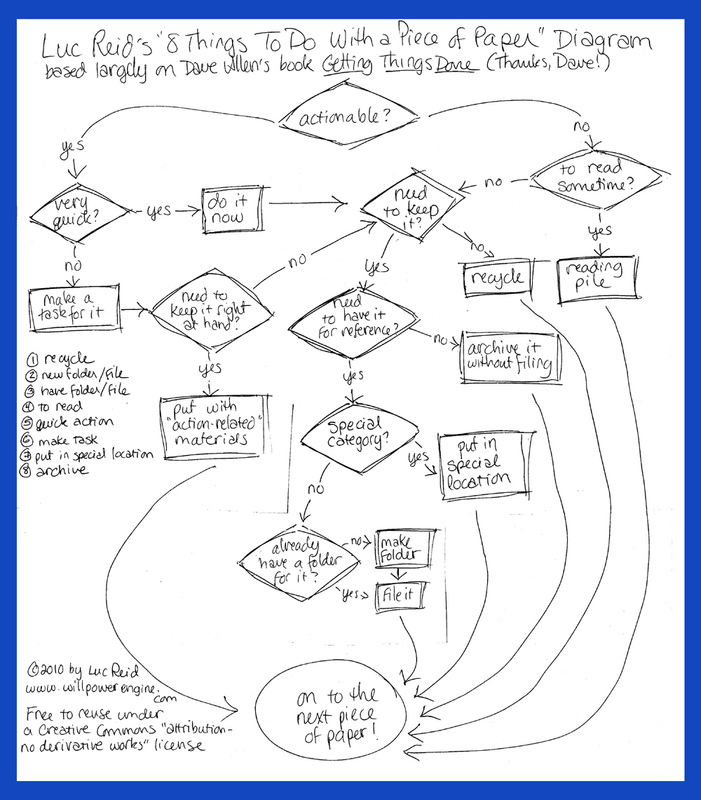 If I see some papers lying around, I can just pick them up, apply this process, and voila! Gone. If you can cut loise a big block of time, you can gather together every paper you having lying around anywhere, put it all in a big pile, and then just mow through it. The diagram above can serve as a handy reference if you find references handy. 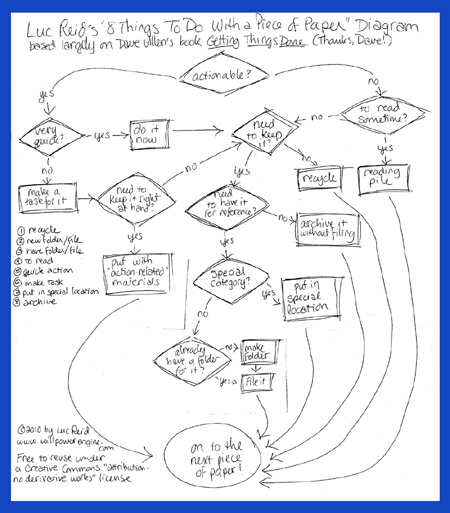 Allen offers a completely different diagram based on the same principles (his) in Getting Things Done. Put it back down where it came from.